Naturally gluten-free, these irresistible Decadent Chocolate Quinoa Brownies are made with cooked quinoa, cocoa, nut butter and chocolate. Gooey, soft and very more-ish. A lovely snack, or even dessert with ice cream. It may be the meteorological start of Spring, but no one told Mother Nature. After a relatively benign winter most of the UK is currently being hammered by two storms: the “Beast of the East” (blizzards) and Storm Emma (more blizzards). Right now we are under a red weather alert, meaning no one should venture out outside. I’m very law-abiding and cautious so this suits me fine. And because I’m warm and cosy inside (head to toe thermals, plus ski socks) it’s kind of exciting. The gas fire is on; I’ve had a mug of proper hot chocolate; and I’ve even treated myself to afternoon central heating. Woo hoo! Despite trying very hard to concentrate enough to do proper work, I have been pacing around in front of my windows, staring out as the snow piles up. As a Floridian I still can’t get used to the white stuff. The last real snow event was 2010, and I remember cabin fever setting in very quickly, driving me a bit crazy. My antidote then as now is baking. Which is a very un-Food To Glow-like thing to do. I of course bake. I have baking recipes on the blog and I love all of them. But, making cakes, brownies and buns is not a natural fit for me. But last night, at around 10.30 pm, while waiting for Andrew to do a planes, trains and automobiles thing to get back from London (I finally saw him this morning…) I had a rather good baking idea. I scoured the Internet thinking that someone must have made it and, to my amazement, saw nothing similar. Not at all. So I knocked up half a recipe, with waaay out of date yeast, and let it prove overnight in the conservatory – aka my winter, walk-in refrigerator. food to glow savoury hot cross buns coming soon! I really didn’t expect anything as the yeast really looked a dud, but this morning I shaped the dough, waited patiently for it to rise again before baking and, Lordy Lordy, they were fantastic! Super savoury, tasting cheesy but containing no cheese at all. We fell upon them as soon as they were out of the oven, pulling the buns open and sliding in slivers of goat’s butter. Absolute heaven. I still can’t believe that the recipe worked. Once I get some in-date yeast I will make it a couple more times and give you the recipe in time for Easter. It made nine plump golden buns. All have been eaten. Between two of us. Meantime, if you are suffering from cabin fever and are in need of some baking ideas, you could do far worse than giving these a go. They sound a bit mad calling as they do for cooked quinoa, but trust me they are gorgeous. I’ve made them several times for work, always making sure that I need to “neaten the edges”. Otherwise known as baker’s perks. These contain no calories, of course. This recipe is adapted from one in a lovely new baking book called Modern Baker. The book features loads of savoury and sweet sourdough recipes, which you know I have no patience for, but also a number of healthy-ish, no-planning recipes like this one. Just a tip: I made one batch with cooked quinoa from a pouch. Which is obviously a brilliant idea. What would have been more brilliant was to have read the ingredients label before dumping the contents into my food processor. Had I done so I would have seen that it contained black pepper and rosemary…. Still delicious! Tahini-swirl black bean brownies on food to glow. What’s your favourite rainy or snowy day baking treat? Preheat the oven to 180C fan/200C/400F/ Gas mark 6. Fully line a brownie pan (26 x 20) with overhanging baking paper. Gently melt the chocolate, nut butter and butter-butter in a bain-marie. Let it cool for five minutes. Pop everything into the bowl of a food processor and blend. Don’t worry about making it smooth as it won’t do so, and it gives a great “popping candy” texture. Pour the mixture into the lined tin, tap it hard on the counter to even it out, and pop in the heated oven for 18-20 minutes. If you have a hot oven definitely pull it out at 18. They should feel slightly tacky to the touch. Let the brownies cool (argh!!) before lifting out by the paper and cutting the brownies into 15 pieces with a serrated knife. Yum! Your pictures are so beautiful! Thanks, Mr A. Man of mystery! Oh, wow, I never thought to add quinoa to a dessert! I’m going to be trying these. & I can’t wait for the hot cross buns!! Stay warm! I didn’t use peanut butter but you definitely could, instead of the cashew or almond butter. Enjoy! This might be the only way I get KP to eat quinoa! If you go deep, deep into the archives of my blog, you’ll find a chocolate zucchini loaf with quinoa from 2010 or 2011. It was really good, but I haven’t made it in ages. Must give these brownies a try and reminisce over that loaf. I do really enjoy quinoa in baking, it gives such a fun texture without messing up the taste at all. And all that lovely plant-based protein to boot! I’ll have to go for a forage into your archive to see what you did. You might have been the original quinoa brownies lady!!! 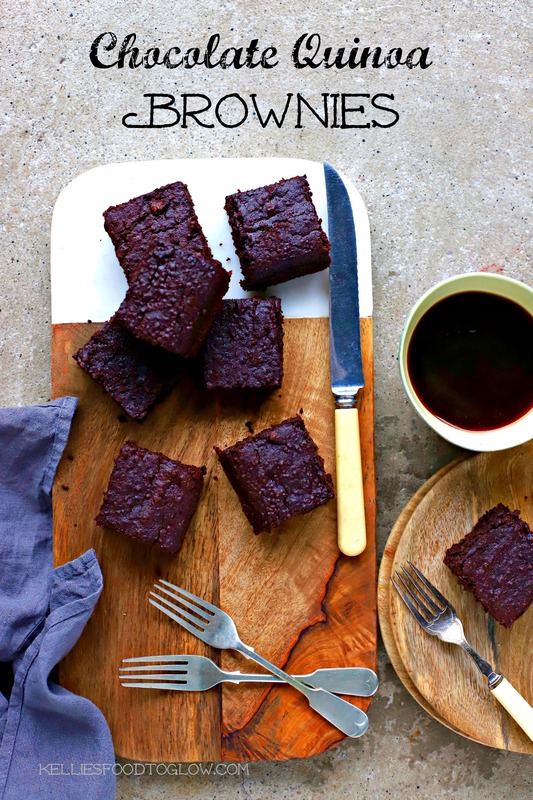 Really love the idea of tahini with the brownies – I must admit it gets added to lots of my suppers – I love it but I’ve never thought of using it like this – inspired! Okay, these brownies are SOMETHING ELSE. They look so decadent and rich that I wouldn’t cut them into squares. If I were to make this (hopefully vegan-friendly), I would simply take a spoon and dig right in! Such a fun idea to add quinoa to a dessert! Love the recipe!